By the time this issue goes to press, the snow in my backyard probably will be only knee deep in the shade. It's the middle of April now, and there's still a six-foot snow drift on my back deck. Needless to say, it's been a long, cold winter. This issue of Linux Journal is cool as well, but in a far more enjoyable way! The first time I was published in Linux Journal, it was in a Cool Projects issue, and every year it means a bunch of really nerdy ideas and awesome recipes for weekend projects. This year is no different. Reuven M. Lerner starts out the issue with an article on Discourse. Web forums certainly aren't anything new, but Discourse is a modern-looking, modern-functioning, discussion forum. Its slick interface and elaborate underpinnings mean it can be challenging to install, but Reuven walks through the things that make it tick and explains why it's worth the hassle. Dave Taylor also shows that hard work pays off, as he ends his series on the script-based version of Zombie Dice he's been building the past few months. Kyle Rankin finishes off his series as well. The Tails distribution is a security-minded Linux system that has tons of privacy-enabling bells and whistles. Kyle describes its advanced features, reaching above and beyond what most folks do with it. My column is also about tools this month—basic shell scripting tools. Dave Taylor provides advanced scripting every month, but for many of us, the basics are still pretty cryptic. If you don't know an IF/THEN conditional statement from a range-numerated FOR loop, this article should be useful. I'm a little angry with Bill Childers this month, because he has a great article on hacking a Parrot A.R. Drone. I think it just about guarantees I'll purchase a drone in the near future to hack myself. Bill explains that the readily available "toy" drones are incredibly robust machines capable of far more than just scaring cats. In true "Cool Projects" fashion, Joshua Datko combines two awesome bits of technology into a teeny, tiny, super-powerful device. 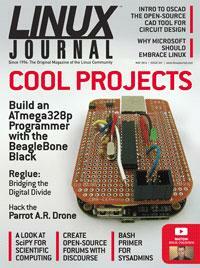 He combines the surprisingly powerful BeagleBone Black with an ATmega328p microprocessor. The BBB plus Arduino? It sounds like a nerdy version of, "hey, you got peanut butter in my chocolate"—it's a marriage made in heaven. Rakhi R and Kannan M. Moudgalya describe the Oscad program this month. CAD software can be ridiculously expensive if you buy a proprietary option, and often the free and open-source options aren't quite as robust as you'd like. With Oscad, however, you can design and test PCBs using 2-D and 3-D interfaces. The software not only helps organize the layout of your boards, but it will simulate the actual operation of the circuits as well! Oscad is a cool project itself, but it's also a great tool for creating even cooler projects! Finally, Doc Searls and Brian Conner prove that cool Linux projects aren't always something that can be done over a long weekend. Brian Conner interviews Ken Starks about his Reglue organization. Reglue recycles hardware and uses Linux to provide usable computer systems for education. We all know that Linux is changing the world, but that change only occurs when we have people like Ken wielding it. Doc takes an interesting look at Linux as well, but he posits what might happen if Microsoft were to adopt Linux. I know you're thinking it'll be a Minnesota-cold day in ____ before Microsoft turns to Linux, but crazier things have happened. This month's focus is always one of my favorites. We also have product announcements, tech tips and more. The cool projects, however, are something that everyone seems to enjoy. They warm my heart, and after a winter like the one we're finally ending, a warm heart is a welcome effect.